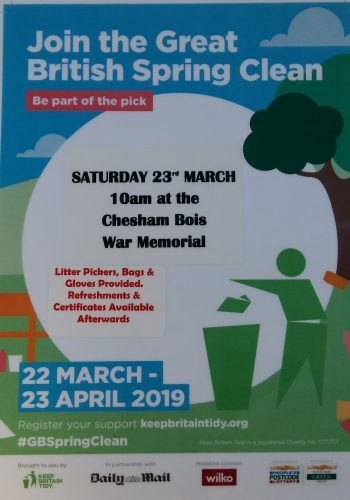 All Together Community are starting a new project in Chesham Bois. They will be holding a free lunch club, once a month on a Friday between 12 noon and 1.30pm in Chesham Bois Scout Hall. Older people (65 plus) are invited to come along enjoy lunch and then participate in activities with children from Chesham Bois School. Contact Louise on 07956 190291 or email info@alltogethercic.co.uk to let her know if you wish to attend or know someone that may wish to attend. Thames Valley Police, Chiltern and South Bucks District Councils’ Community Safety Team and Trading Standards are inviting members of the public to the launch of Operation Gauntlet, the Chiltern and South Bucks Scam Awareness and Prevention campaign. The launch will take place at Chiltern District Council Offices in Amersham on Tuesday 5th March. There will be two sessions one at 4pm-5.30pm and the other at 7pm-8.30pm. There is no need to book, just come along to either session to find out about current scams and how to protect yourself and others from becoming a victim. The sessions will also include a presentation by Chief Inspector Tim Hurley (Deputy LPA Commander) and there will be an opportunity at the end of each session for questions and answers.